With nylon strings that are easy on little fingers, and the right sizing for young players, a 3/4-size classical guitar is perfect for kids or beginners. Steel-string acoustics and other folk guitars give your child finger blisters and pain. As a guitar teacher for many years, I have often seen kids get discouraged and quit because their fingers hurt. Classical guitars have nylon strings, which are way easier on the fingers. Size-wise, a 3/4 scale guitar allows kids to reach the strings and the frets comfortably. There's no way kids can reach around a full-sized dreadnought folk guitar. This guide has the best kids-sized classical guitars to get your young player started out right. I'm a big fan of Yamaha instruments, from keyboards to drums to guitars. This is a brand that is known for quality products across a wide range, and they also have a reputation for excellent customer service. Yamaha products are typically high quality, and a Yamaha guitar, keyboard, or drum set will play better and last longer than a comparably priced instrument from another manufacturer. For kids and beginners just starting out, I recommend this 3/4-scale Yamaha kid's classical guitar package. The 3/4-scale feature means that it's smaller than a full-sized guitar for an adult, but just about perfect for kids. There's no difference in quality, sound, or durability in Yamaha's kid-sized guitars. 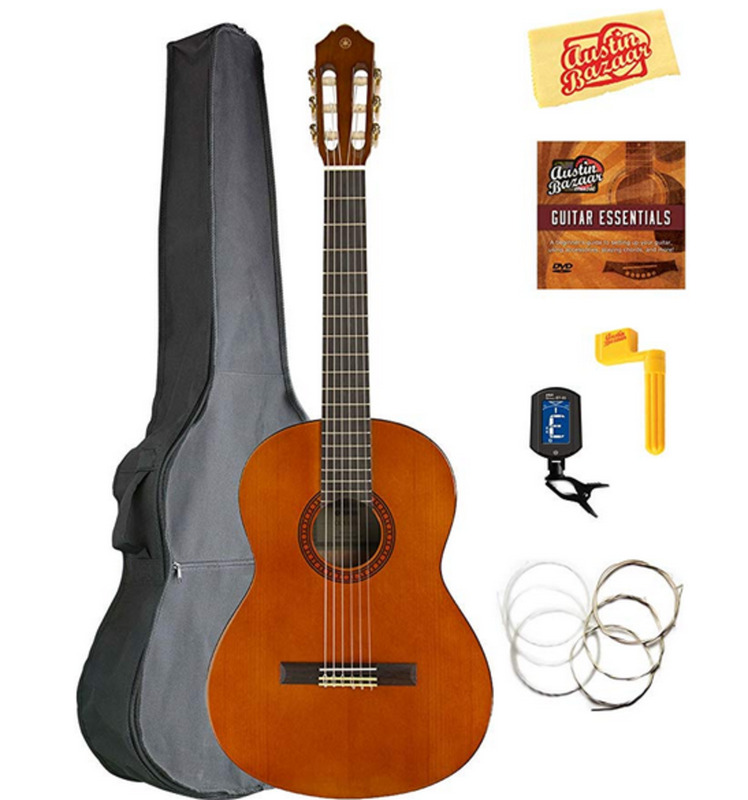 The reason I like this particular kids classical guitar is that it comes with a very complete package of accessories and necessities that every guitar student will need at some point. 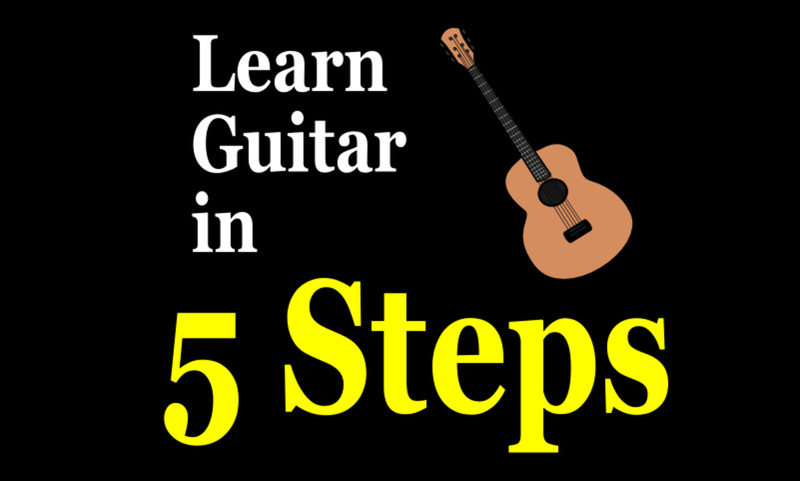 I recommend this package based on years of experience with my guitar students. It's solid and dependable, and it's backed by the full support of the Yamaha customer service team. But the best thing is the accessories package that comes with it. Yamaha includes everything you'll need to start playing right away -- and trust me, you do not want to go through the process of finding and paying for a good beginner's classical guitar and then find that you're missing some essential part. That happened to me with a drum set I bought for my kids one Christmas, when we realized that it didn't include drumsticks. 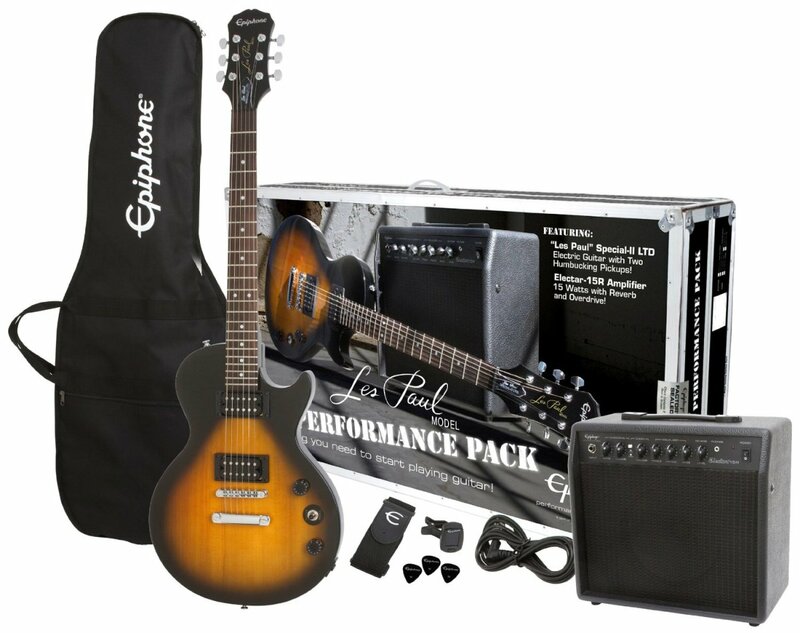 Avoid a tear-filled scene with your kids by getting a guitar package that includes everything you'll need to start playing right away. 2. Price range -- how much should you expect to spend? 3. 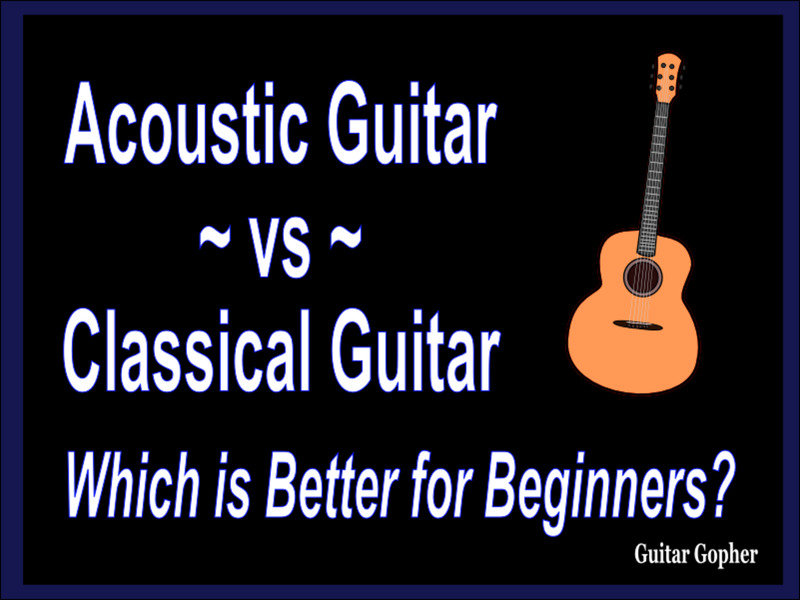 Folk versus classical guitars -- which is the best kids guitar? 6. Lessons: will you have to pay a teacher, and how much? 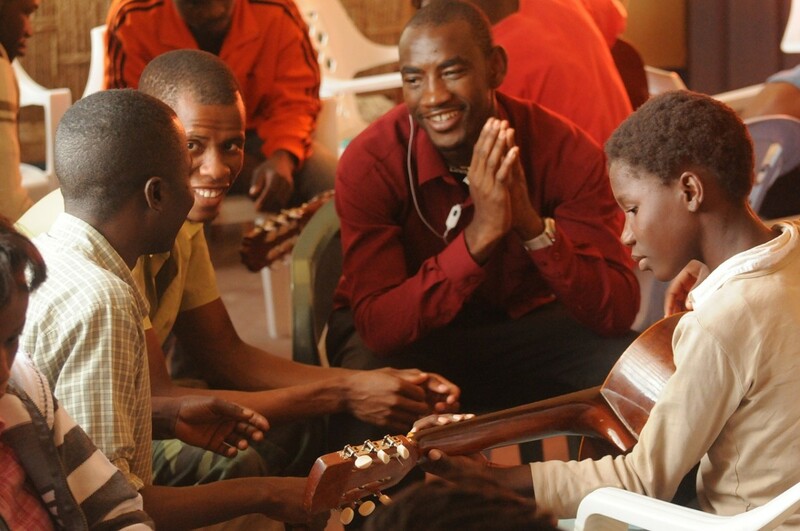 My experience with children's guitars and lessons goes back many decades. Over the years I have had plenty of first-hand experience with instruments of all kinds and students of all ages. How Much Should a Child's Classical Guitar Cost? The short answer: A good kid's classical guitar should cost between $100 and $200. Less than that, and it's probably either just a toy or a really cheaply made instrument with poor customer service. More than that, and you're getting into the next-level guitars, those intended for more serious, established players. Classical guitars are often found in recording studios as part of the range of in-house instruments available for artists. The nylon strings give a classical guitar a distinctive, rich sound. High-end classical guitars, especially vintage guitars, can cost thousands of dollars. Of course we're not talking about those models here, so let's begin with a good option for families with a budding guitar hero and not a ton of cash to spend. Gig Bag -- even if you're not playing "gigs," you'll be surprised by how often you need this. It's always raining when your little decides she *has* to take her guitar to school. Extra set of nylon strings -- because sooner or later you're going to break one. String Winder -- makes putting on new strings much easier. Polishing Cloth -- I never use these, but they always include one in these packages! Money: How much do you have to spend? A good child's classical guitar doesn't have to cost a lot -- there are some really good options out there for under $100. Age: How old is your young musician? This is a more important question that it is for some other instruments, such as music keyboards and drum sets. For those instruments, children as young as four or five can have a good experience, and there are models that are designed specifically for little ones. With a classical guitar, however, the child needs to be old enough to make the experience worthwhile. 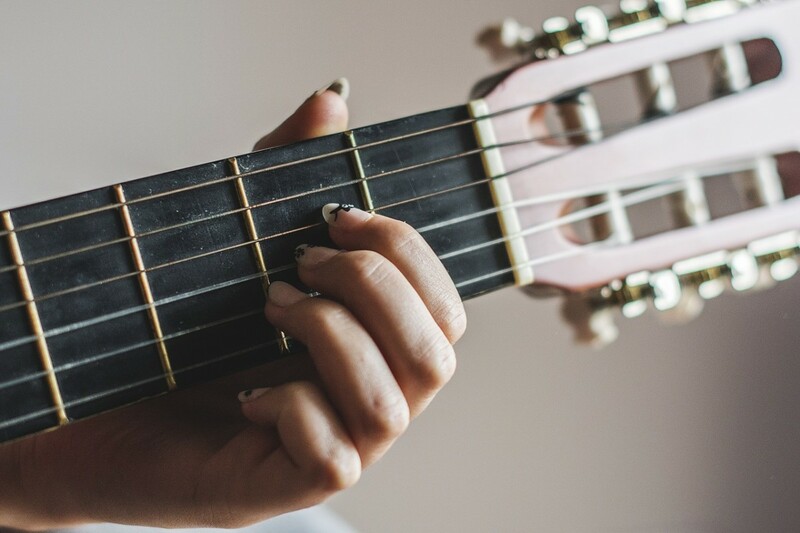 With few exceptions, children younger than 8 or 9 years of age will lack the hand size, coordination, and patience necessary to even get started on classical guitar lessons. For older children, however, a kid-sized classical guitar is an excellent choice. Lessons. You need to consider how your child is going to actually learn to play the instrument. Do you have someone to give your child lessons? While many music keyboards for young people and kids include a "tutorial mode" that can be very effective, this is not possible for acoustic guitars. The more serious you and your child get about their instrument, the more appropriate it is to consider finding a guitar teacher. A good teacher can change a child's life! Strings and Finger Pain. This is an issue that many parents overlook when selecting a child's classical guitar. Wire or steel strings are standard on most acoustic guitars, while classical guitars have nylon strings. Steel strings are vary hard on young fingertips and can cause blisters and pain, so you want a guitar with nylon strings, like a classical guitar. I have seen the issue of finger pain completely derail beginning players, so be prepared! Durability. 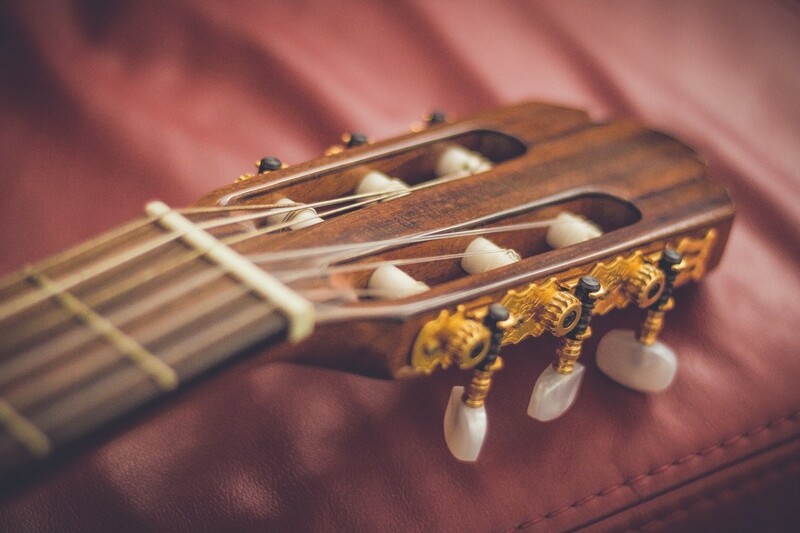 Classical guitars are among the most fragile of instruments. They are also sensitive to heat, cold, and humidity. A very cheap child's classical guitar can quickly become worthless, especially when a young person is in charge of taking care of it. The best guitars for beginners are therefore those that are both affordable and built to last. How Big Should a Child's Classical Guitar Be? Guitars are available in full size and 3/4 size. Full-size guitars, of course, are designed for adults and are all about the same size -- differences in the size of full-size guitars are due mostly to the design and are usually not very noticeable. Short scale or 3/4 guitars do look smaller than a regular sized one, especially when it's on an adult and they're standing up and playing. It's unusual for an adult to play a short-scale guitar by choice, although there are exceptions. Bill Wyman, former bass player for The Rolling Stones, regularly played a short-scale bass with the band. For children and kid-sized players, a 3/4-scale guitar is a perfect fit and almost always the way to go. 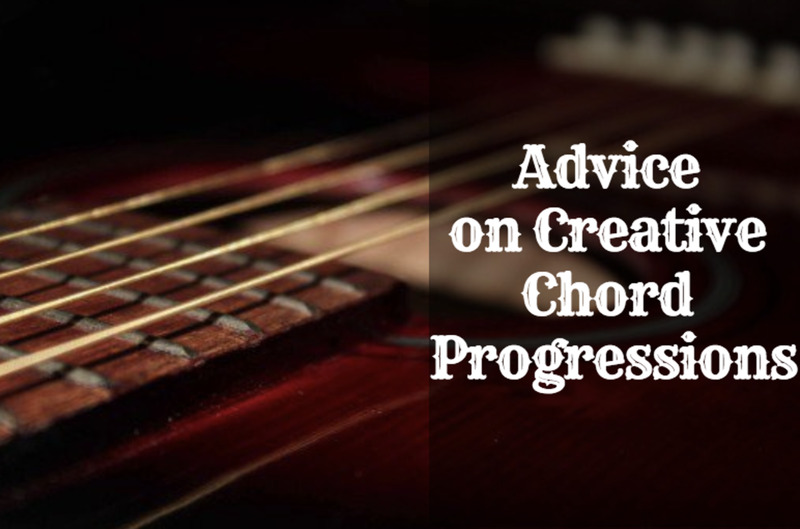 It can be nearly impossible for them to form chords on a full-sized fretboard, and even if they manage to, the weight of a full-size guitar will make playing really uncomfortable. A "scaled-down" kid-sized classical guitar will be suitable for years, until they're truly big enough to handle a full-scale model. Non-electric guitars can be strung with either steel or nylon strings (electric guitars must have steel strings in order for the pick-ups to work). Some styles, chiefly classical guitars, are traditionally strung with nylon. As I discussed above, nylon strings are much more comfortable for beginners and children, and don't push into fingertips like wire strings do. I learned how to play guitar when I was about ten years old. I learned on my mom's folk guitar, which she had strung with nylon strings for comfort. Based on that experience, I always recommend that my students consider buying nylon strings and putting them on whichever guitar they own. 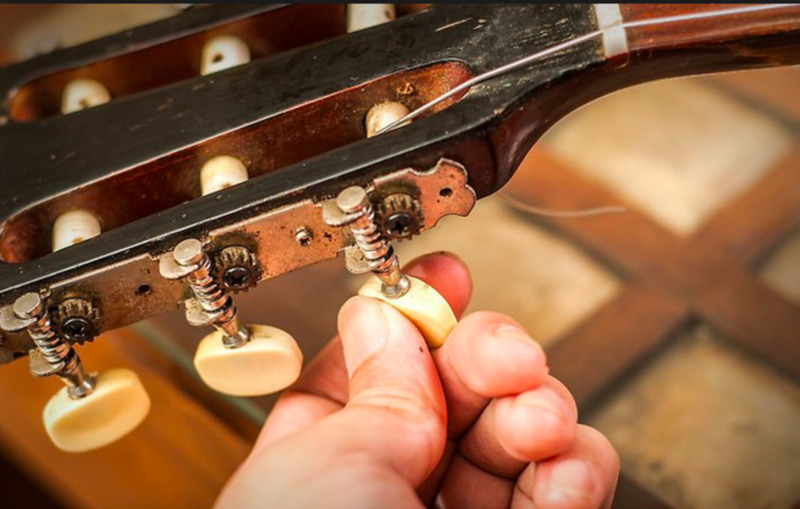 This can make a big difference in how enthusiastic a beginner is about daily practice, because until you build up callouses on your fingers the feeling of steel strings can be painful. By choosing a nylon-stringed classical guitar, you take care of the painful string problem automatically. 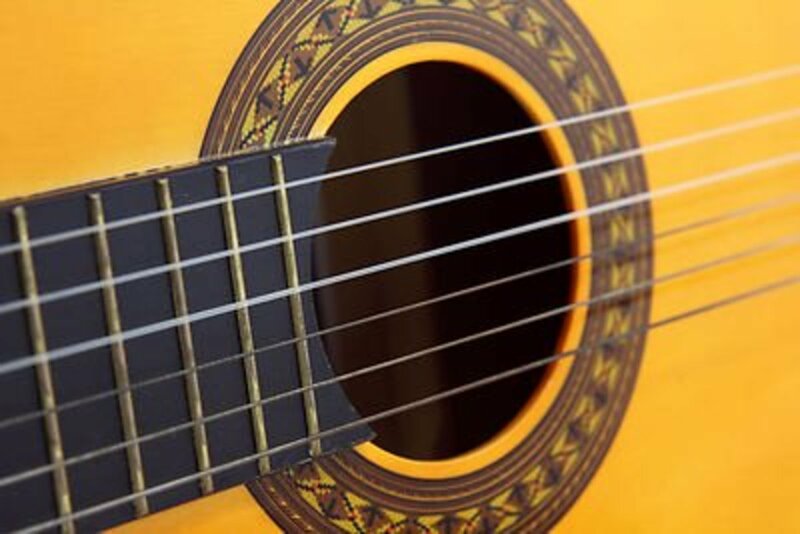 Classical guitars are always strung with nylon strings, unlike folk and other acoustic guitars, which are almost always strung with steel strings. The benefit of pain-free practices will quickly make a big difference in how often your child practices. This is an excellent option for kids who want a scaled-down nylon-string folk guitar instead of a classical guitar. Fender is one of the great names in electric guitar culture, and their acoustic instruments are also known for their durability and style. This package is an excellent example of the hybrid folk/nylon string arrangement discussed above. This model is the right size for a kids guitar, and has comfortable nylon strings already strung on the instrument. If you're buying a kids classical guitar, then you'll need to consider getting them lessons of some kind. Your solution will depend on several factors, many of them specific to your family or your children. In general, a good kid's classical guitar teacher will cost about $50 an hour; if you have two young ones in the same family taking lessons, you may be able to arrange a package deal. I used to charge $60 an hour for music lessons for kids, and never had a shortage of students, but I was a bit more experienced than other teachers in terms of rock and roll and recording experience. Although electronic drums and music keyboards often have a lesson or tutorial mode that can get things started, this is obviously not a feature of guitars, and that increases the chances that you'll need an actual human teacher. However, you don't necessarily need to arrange in-person lessons -- there are good online courses and YouTube tutorials that are often a great way to learn the basics without spending much money. My own children used to turn to YouTube tutorials to learn songs on both piano and guitar, and they spent much more time with virtual instruction than they did with me teaching them. 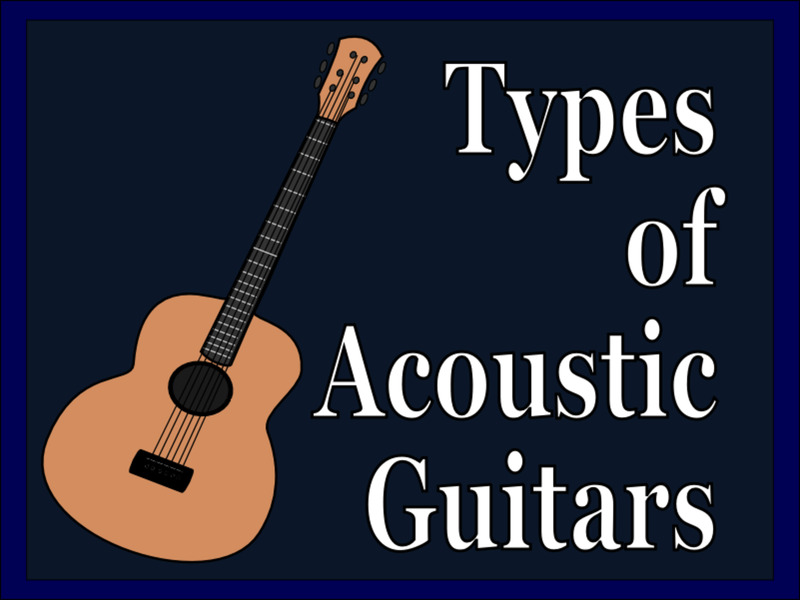 Choosing a Child's Acoustic Guitar -- Learn about your options for buying the right guitar for a child or beginner. An acoustic guitar with nylon strings moght be the way to go! Choosing a Chld's Electic Guitar -- Many parents choose to buy an electric guitar for their child. Here's what to think about when you're making your decision.